To keep pace with an increasingly digital world, enterprises are transforming their data infrastructures using all flash storage. As a leading all flash storage provider, NetApp simplifies your infrastructure to improve economics, while accelerating performance and increasing availability to enhance your company’s competitiveness. NetApp future-proofs your IT investments, allowing you to grow with confidence. NetApp® all flash storage reduces your storage footprint, power, and cooling by up to 10x; doubles performance at half the latency of leading competitors; and lets you migrate confidently from your existing SAN with a pathway to the cloud. 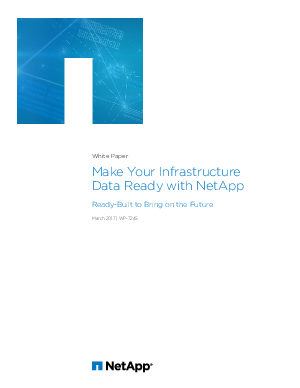 With NetApp, all flash arrays, your business is prepared to take on anything and everything the future can throw at it: rapid growth, new technology, or a shift in the industry. Cut fear out of the equation. Be data ready to bring on the future.